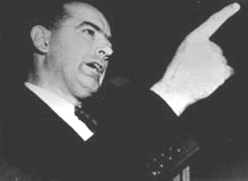 Senator Joseph R. McCarthy during the early 1950’s claimed that he had “lists” of Communists, first within the State Department and then he expanded his “Black Lists” to include others including Actors, film writers, etc. “McCarthyism” reached its height in 1953 when he held Senate hearings and bullied the defendants. When he challenged the U.S. Army in 1954, his tyranny was exposed on Television and the Senate voted to censure him. Come check out our collection on this infamous Senator and McCarthyism.